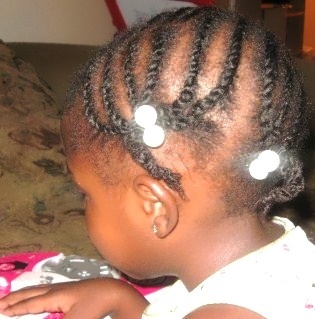 Her hair (my daughter's) has come a long way!! 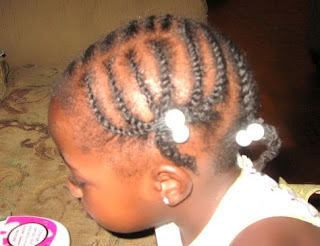 This week, she is wearing flat twists (parted in four sections.) This was so easy to do. 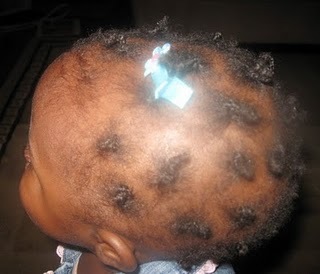 Flat Twists are usually quicker to put in than cornrows, which is very practical for a 2.5 yr old. As always, her hair is moisturized daily with water mixed with oil and aloe vera juice. All hair decorations are removed before bed time. She sleeps with a satin bonnet that comes off every so often. I have to get a silk pillowcase and crib sheet for her! @Precious Yes Dear. Thanks for stopping by!